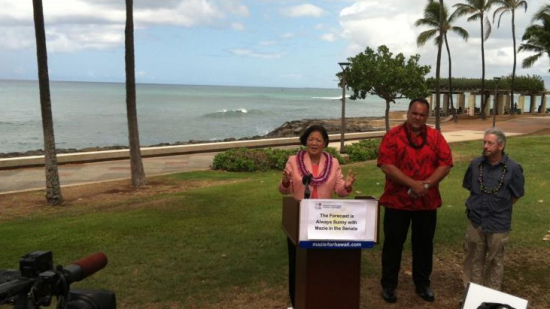 Rep. Mazie Hirono speaks at Kakaako Waterfront Park in Honolulu. “Sept. 11 is an especially solemn day here in Hawaii as we remember both the devastation and lives lost in 1992 and 2001. In the immediate aftermath of both Hurricane Iniki and the terrorist attacks, neighbors and strangers joined first-responders to help those injured and save lives. And, in the days that followed each tragedy, communities came together to offer support and start the long, hard process of cleaning up and rebuilding. “Today, 20 years after Hurricane Iniki struck our state, the island that was most affected is a completely different place because of the people who worked together at the local, state and federal levels to rebuild Kauai. Now, Kauai is among the most resilient and well-prepared islands with a stronger, more sustainable economy – it has re-emerged as a place that few could have imagined in the wake of the hurricane. “The 1992 hurricane that devastated parts of our state showed that we are one people, especially in times of need. “The 2001 terrorist attacks showed the world a similar quality – the unthinkable toll in lives lost and damage caused didn’t stop our nation from unifying as one people. We have since worked together to rebuild and ensure that our country is better protected from terrorist threats. Hirono suggested commemorating the anniversaries by donating to the American Red Cross. According to the Weather Channel, Iniki was the deadliest and the costliest hurricane to ever strike Hawaii. The death toll of four was remarkably small for an intense hurricane. Adjusted for inflation, Iniki caused roughly $3 billion in damages. More than 14,000 homes were affected, with 1,421 destroyed and 5,152 with major damage.